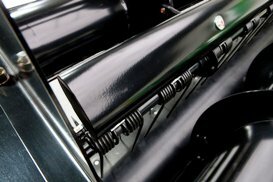 The A-Series conditioner rolls are a full 2591-mm (102-in.) wide for crimping performance and ensure thorough conditioning of the plant stem. 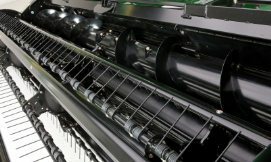 The use of the steel-on-steel intermeshing roll design ensures that leaves are retained for high protein value, providing high-quality hay, forage, and alfalfa crops. The straight design of these conditioner rolls makes them easy to repair, as damaged sections can easily be cut out and replaced. 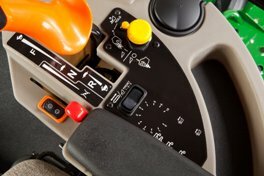 An optional reverser is available for the W155 Self-Propelled Windrower only. It is easily activated from the operator's station to clear the platform of plugs that may occur. 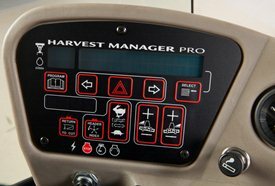 On the 400D Draper Platforms, the reverser slowly reverses the knife drive and optional hay conditioner if equipped to clear plugs. The reverser is highly recommended when using the optional hay conditioner with the 400D Platform. 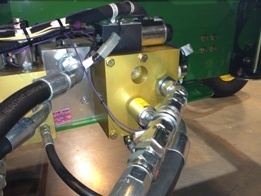 On the 100A Auger Platform, the reverser slowly reverses the conditioning rolls, auger, and reel. This makes a difficult job easier, so the operator can be more productive. Operators can run the machines nearer to their maximum capacity and it will take less time to unplug, adding to the machine's productivity. The reverser consists of a valve block and valves, shown in image above. It is the gold-colored valve block on the right side. It is shown plumbed for a 100A Auger Platform. The windrow width is adjustable from a narrow, 0.9-m (3-ft) swath to a wide, fast-drying, 2.3-m (7.67-ft) swath, depending on crop conditions. 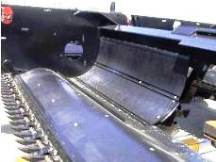 Crop feeding is enhanced by the 100A Platform’s poly feed pan design, progressive feed paddles, and unique stripper bars, which combine to allow for smooth feeding even in adverse conditions. 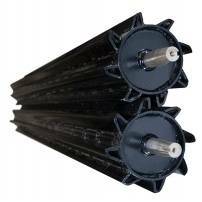 The poly auger pan reduces mud buildup, improves crop flow, and is easier to clean. The poly is longer lasting than other transition pan materials, as well as less susceptible to rock damage. 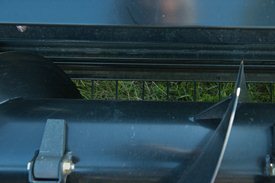 The feed pan is made of two separate bolted-in sheets of poly. This sectional design allows for easier replacement than steel feed pans. Large-diameter, 6.35 mm (1/4-in.) 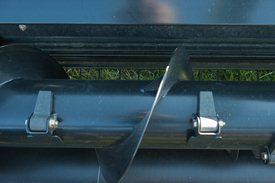 reel teeth are stiff enough to maintain control of the crop from the cutterbar to the augers for even feeding, especially in heavy crop conditions. The teeth nearest to the reel cam are formed to improve crop flow by the reel ends. 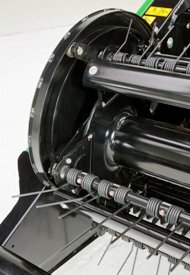 Standard 100A Windrower Platforms feature six bat reels. 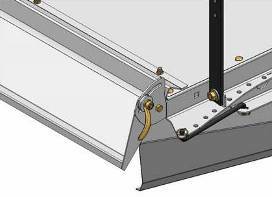 The 160A Grass Seed Windrower Platforms feature a seven-bat reel.